Benjamin Franklin said many years ago, “Early to bed and early to rise, makes a man healthy, wealthy, and wise,” maybe that was true in the 1700’s, but now a day it takes a lot more than just going to bed early to achieve the same results that Mr. Franklin wanted to achieve. Mr. Franklin wanted to be healthy, wealthy and wise, I find that having a healthy mind, body and pocket is the thing to achieve today, although it basically means the same thing, you cannot achieve it today just by going to bed early and getting up early, although it doesn't hurt. As of this writing, I am sixty-two years old and it took me losing everything I had to learn that lesson. Like many, I always thought that having money would make me a happy person, but money does not necessarily mean happiness, although it definitely helps the situation. Although my number one goal after losing everything was money, I found that just pursuing money in life was an empty life. The last time I went for a check-up the doctor said, "I very rarely see people your age in such good shape,keep doing what you are doing." So, I guess I must be doing Something right and everything I do, I put in this book. Jerry P: "I have read all of Chris's books, his sense of humor is second to none. 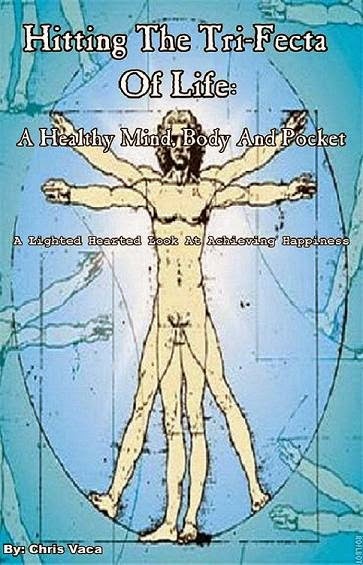 I laughed and learned throughout the book, especially the healthy body chapter, I love this guy." 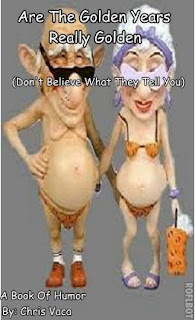 Evelyn: "I found this book very entertaining, his views on dieting left me in stitches. His views are out of the main stream, but like he says in the book, it worked for him , it could work for you. enjoyable read. Jason S: "I think everyone would enjoy this book, whether you are broke or not. His outlook on life is very refreshing. I recommend it." Margret L: "The author does not follow the mainstream views, his outlook on dieting, attitudes and life in general is refreshing." June: "I can't think of a better book for motivation, it truly helped my mind, body and pocket." Intro: This book is being written for those of you who have ever uttered the words "I'm too old to do that" or "I'm too old to start something new" or any other phrase that contain the words "I'm too old" or "at my age." Over 50's hit the hardest: The harsh reality for baby boomers and what they are facing during the current economic situation. For those over 50 the jobless rate has doubled since the recession began and the older you are when you lose a job, the harder it is to find a new one. Do we really know what success is? : Describing the different meanings of success, it is different for each individual. Do not base your success on what other people say it is, although success is different for everyone, the steps to get there are the same for everyone. Don't be afraid of the F word: Explaining the importance of failure on your way to becoming successful. Without failure, there can be no success. Success is the ability to go from one failure to another with no loss of enthusiasm. I will cover this and so much more. 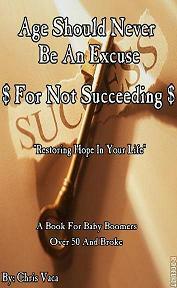 Stop sitting around feeling sorry for yourself, take control of life and your future, this book will show you how. What I wrote in this book worked for me, there is no reason it will not work for you. F. Rossini: "Inspiring and honest.The author doesn't claim to know everything but tells his story with humility and this is what made me start MY new beginning." Valerie: "The author of this book has a story that is both inspirational and motivating he seems to have a writing style of his own which has you believing that he truly believes in what he is writing. I also like the way he adds a little joke at the end of every chapter, even though the entire book has humorous overtones. I recommend this book if you want to feel good about yourself and also learn something about yourself. Thumbs up on this one." Sandi Krouse: "I enjoyed this very much. Chris's story is real and while he doesn't sugar-coat the subject, he offers real hope to people of all age who find themselves at a crossroad in life. Very inspirational story. Billy Cofer: "I look in the book review section of the paper each Sunday for a local author's book. When I downloaded this I never put it down. The references to Dale Carnegie, Napoleon Hill and the like gave it a nice touch. I plan to put the P. M. A. into use. I feel better about life already. Thank you for your honesty, humility and down-to-earth good advice. I also appreciate your reference to God's work in your life. Again, thank you"
Jerry P: "This is truly a motivating and inspiring story, the author has a unique way of writing and it feels like he is telling his story directly to the reader. I think this book will help people of any age to better themselves. He is an inspiration." Sandy J: "I am 37 years old and I found this book a tremendous inspiration, no matter what your age we all need help as we go through life and this book will do it for you, five stars, a must read if you need motivation." John L: "A very honest and sincere story, His is a writing style I can relate to." Tammy: "This is another book I am adding to my motivational book collection, very inspirational story." Bobby Duncan: "Inspirational and encouraging. A down to earth practical guide to "getting your head straight" and developing PMA. Does sugar coat or gloss over the need for effort, commitment and persistence. Reminds us of the difference between simple and easy."